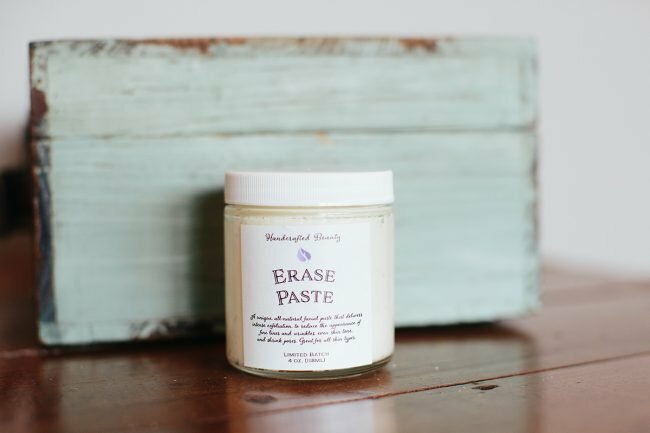 Erase Paste is released in limited batches 2-3 times per year. Due to a “cult like” following (We love you all.. thank you for spreading the word!) we typically sell out in 24-48 hours, and once it is gone, it will not be available until the next launch. Erase Paste is an innovative skin treatment for youthful glowing skin. Formulated to deeply exfoliate and remove dull cells, while delivering optimal nourishment for healthy new ones. This effective treatment helps to Erase fine lines and wrinkles, acne scarring and age spots. The deep exfoliation rivals that of professional Microdermabrasion treatments, achieving maximum results in minimum time. Erase Paste is produced in very limited batches and generally sells out within a couple days. The next batch won’t be handcrafted until late spring 2019. Apply to clean skin massaging into circular motions for one to two minutes. Avoid contact with eyes and mouth. A gentle warming sensation is normal, rinse with warm water and pat dry. Use 2-3times per week. Follow up with Rose Water Toner & Daily Moisturizing Oil. Cocos Nucifera(Coconut)Oil, Castile Soap, Sodium bicarbonate, Prunus Amygdalus Dulcis(Sweet Almond)Oil, Organic Raw Honey, Prunus Armeniacia(Apricot)Oil, Ricinus Communis(Castor)Oil, Simmondsia Chinensis(Jojoba)Oil. Peppermint Essential Oil, Tea Tree Oil. Castor Oil: This oil is well known for its anti-inflammatory, healing and cleansing properties. Castor oil contains a complex chain of fatty acids long known for the ability to reduce the appearance of age spots and scars. Sweet Almond Oil: Full of essential fatty acids, this oil delivers long lasting hydration without clogging pores. Known to firm and tighten the skin. Jojoba Oil: Contains almost all of the vitamins and minerals essential for healthy skin. It mimics your skin’s natural oil providing the necessary balance. Jojoba ensures that skin is deeply hydrated and nourished without feeling greasy. This stuff is amazing. Your skin instantly looks better! I LOVE the Erase Paste. My skin feels so soft after 1 use. My family has noticed a change too!! I can’t wait to order more!!!!!!!! Thank you!!!!! Erase Paste is my new best friend! I love the way it makes my skin feel and the confident feel you get when you skin just simply looks good! This is the best facial scrub I have ever tried. I absolutely love this product! I cannot describe how much I love this product!I also love that it’s all natural. The texture of my skin is so much better after using this product! I’m definitely a forever customer. Currently rationing the last bit that’s left in my jar until this amazing stuff is back in stock. By far the most noticeable difference in my skin from any product I’ve ever used. I LOVE the erase paste! I bought it for the first time when the latest batch came out this fall and I’m obsessed. I’ve been using the daily moisturizing oil for a couple of years now so I was excited to try another product. I literally look forward to using the erase paste! I keep it in the shower and everytime I’m in there, I think “did I just use that yesterday?” because I’d love to use it every day that refreshing feeling afterwards, the super fine scrubbing action, oh goodness… it’s amazing. The erase paste is amazing. I was skeptical about it due to having such fair skin but this stuff rocks! My skin has never felt so soft and I have only used it for about 3 weeks now. I will definitely be getting this again! I bought this yesterday, brought it home and used it. I fell in love with how soft my skin felt after the very first use. I went right back to the store and bought another one for my mom’s birthday! My friend was over in the evening and I let her try it out, she was just as excited about it. I’m headed back to the shop again today to grab one for her and also get the Vitamin C serum for myself. I’m hooked, thanks for your amazing product! !